Have you ever taken the time to take a deeper look into who your dog is beyond the furry cuteness and funny wigglies? Have you considered your dog beyond their dog obedience training and dog behavior of either obeying or disobeying. If you have you might have seen something similar to my observations. Dogs are very similar to people in their temperaments which we refer to on the human side of things as “personalities”. In people we have morning people and those who are not morning people. Morning people love to rise early and start their day, the opposing group however take their time to get out of bed and have an awful time of getting started in the morning. Believe it or not dogs are the same way. 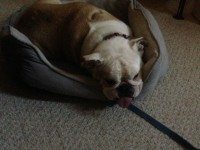 We have experience with dogs that love the early morning and frolic from the time they wake up and we have seen just the opposite dogs that take their time to wake, sometimes having to be coaxed out of bed, called several times, and then they walk slowly from their beds to the start of their day. In my own home, my husband can be either the early riser or the late riser either suites him. Myself however, I am not a morning person whatsoever. With our five dogs, we have a mixture. Belle, our Beagle, is like my husband she can be either be spry in the morning or lay in bed for a little longer. Simba our Golden Retriever Mix is a big morning dog ready and raring to go at a moments notice. Simba’s best buddy, Carson our Pit Mix (a rescue from Hurricane Katrina ) is the same way. Bert our Rottweiler and Winnie our English Bulldog however are not happy to rise before the hour of 6am and preferably no earlier than 6:30am. A 7am or later wake-up call is much preferable for these two. Each morning I have to call both Bert and Winnie bright and early starting with them in particular to get them awake and started so they can catch up to everyone else in the morning’s activities. Both Bert and Winnie are like myself with early mornings, they would prefer to hit the snooze button multiple times before getting out of bed. If they were able to speak I suspect they would sound like teenagers- “Just five more minutes Mom!”. Winnie walks a few feet and lays down again and again and this goes on all the way till we get to the kitchen and she seems to become a bit more awake. Bert and Winnie give me many chuckles every morning, they are so funny. I know with Bert and Winnie I need to give them at least until after breakfast to consider going through their dog training practice exercises. In addition, I find similarities in my dogs when it comes to dog boarding with our vacations or any kind of travel. My husband can leave home and want to travel for a ten day stent and be very happy about the time away from home. Myself however, I think four to five days is plenty and I become dissatisfied and want to return to the comforts of home. Trips longer than four to five days for me are agonizing. When it comes to dogs, ironically this is also very similar. All of our personal dogs seem to be okay with long stents of vacation boarding but Bert and Winnie. They all love staying at my Northern Kentucky dog boarding facility and enjoy the company of other dogs. They love to play, romp, socialize with other dogs, and of course some down time with Stuffed Kongs. Just like me, Bert and Winnie become unsettled around the fourth day. These two individual dogs are not world travelers but instead home bodies just like myself. I also snicker at the fact that neither dog is a “morning dog”. The other three dogs we have Belle, Simba, and Carson can go for the ten day dog boarding stent no problem! “Party On” is their motto. We see these differences in dogs that board with us at my dog boarding kennel in Erlanger, Kentucky. We have both world travelers and dogs that prefer short stays or weekend getaways. Have you ever considered which your dog may be? Morning dog or not a morning dog? World traveler or home body?